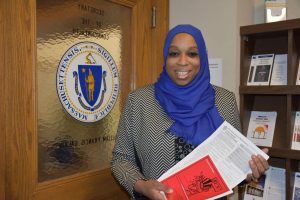 Tahirah Amatul-Wadud, a Democratic primary challenger to longtime Congressman Richard Neal, is attacking her opponent from an unlikely angle — his seniority. Neal, a Springfield Democrat who has served in the House since 1989, would likely be appointed chairman of the powerful Ways and Means Committee if Democrats retake the House in what is increasingly predicted to be a blue wave election in November. But Amatul-Wadud, who hopes to defeat Neal in the Sept. 4 Democratic Primary, questions whose interests Neal would serve in such a role. “Rep. Neal’s voting record and advocacy of certain trade and tax policies suggest he would pursue an agenda favored by corporate special interests as opposed to those constituents in our congressional district,” she wrote in a statement released Thursday, April 5. 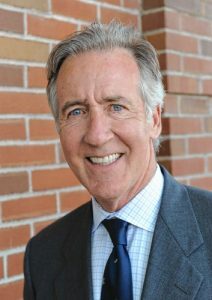 Neal’s campaign responded with its own statement, which says Neal plans to continue to fight for initiatives like restoring the Colonial Theatre in Pittsfield, Union Station in Springfield, and securing funding for the Hilltown Community Development Corporation, which provides affordable housing. In her statement, Amatul-Wadud blasts Neal for his initial support of investment provisions the Transatlantic Trade and Investment Partnership that five other Democrats on the Ways and Means Committee objected to, as well as support of a corporate tax loophole that would have taxed profits on intellectual property at a lower rate than other profits. “It is a myth to think that once he is chair we will benefit,” Amatul-Wadud said in an interview, citing statistics that the First Congressional District, in which Neal serves, has the lowest median income in the state and the second highest unemployment rate. “We literally can’t afford a chair or ranking minority member who will exacerbate income inequality and wage stagnation,” Amatul-Wadud said in the statement. As for what would happen to the chairmanship of the Ways and Means Committee should she be elected, Amatul-Wadud said there are more progressive Democrats in line behind Neal who would then take up the gavel. She named both civil rights icon John Lewis of Georgia and progressive Austin, Texas, Democrat Lloyd Doggett, who are both senior members on the committee. “Under Rep. Lewis or Rep. Doggett, the committee’s Democrats will be in good hands,” she wrote. Recently, the Boston Globe published an article about the potential for both Neal and Second Congressional District Rep. James McGovern, D-Worcester, to claim chairmanships on the Ways and Means Committee for Neal and the Rules Committee for McGovern. In the article, Neal said he would pursue a repeal of the state and local tax deduction cap put in place by Republicans last year as well as lower health care premiums and more secure pension plans if he becomes chairman. Amatul-Wadud said that Neal has received millions in corporate campaign donations and that she has pledged not to have a Super PAC. Neal was criticized last year for not being present in the rural portions of his district, which includes Springfield, where Neal once served as mayor, and 86 other communities throughout western Massachusetts, including all of Hampden and Berkshire counties as well as portions of Franklin, Hampshire, and Worcester counties.